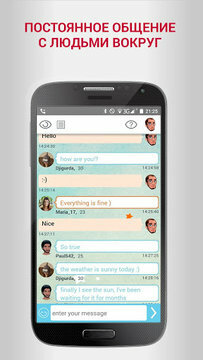 Look Around is a GPS-oriented messenger for instant communication to people nearby. It is your opportunity to spend time on the road or in the waiting hall, in a club or restaurant and make new acquaintances with interesting people. New possibility - automatically expanded radius. If there are no active users next to you the app makes search in a zone with larger radius. You can meet the companion from any place of the world. Updated: 25 января 2019 г.